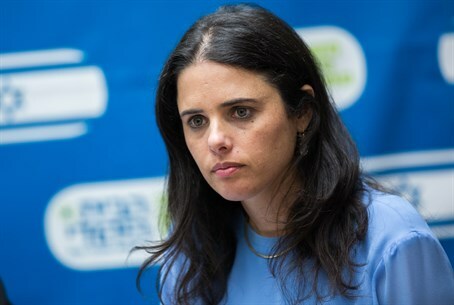 Justice Minister Ayelet Shaked (Jewish Home) condemned the horrific attack on a Palestinian family in Duma last week, noting that such an attack constitutes a genuine security issue and not a specific attempt to frame the right wing in Israel. "This attack is terrorism," Shaked said, speaking on Israel Radio. "There is no connection between it and the right wing. This is terrorism, terrorism for its own sake, and we should treat it harshly." "It's not about the Right, or 'settlers'," she stressed. "It's the right of the Israel Security Agency to deal with terrorism, even if it is Jewish terrorism." "Jewish terror against the State is even more harmful to security than Arab terrorism," she continued. "We have experienced very few attacks against the Arabs, but such an attack does do great harm to state security and we need to use all resources to handle it." Thursday's arson attack in the Palestinian Authority (PA) village of Duma killed a baby and injured four family members. The IDF and security officials have deemed "Jewish terrorists" to be the perpetrators, but little evidence to that fact has been revealed in the investigation of the incident. Meanwhile, the attack in Duma led to national and international outcry, with the US and EU calling for "zero tolerance" for crime after the attack, and Prime Minister Binyamin Netanyahu vowing to use "all resources" to bring the perpetrators to justice.